When I was a young child, game consoles were basically a babysitter for me. I didn't really throw fits or do anything that would be considered destructive, and so my parents felt comfortable leaving me alone with books and games, since they didn't feel it'd have some great detrimental effect on me. They didn't understand them in the least, but at least they didn't think games would be some life-sucking device, as long as I sat far enough away from the TV screen. Thus, my time in California was filled with Zombies Ate My Neighbors, Batman, and Super Mario All Stars. I played these games, but with no real appreciation. They were something I did with my friends, but so were board games and playing Power Rangers. It was just a pastime. Yet a little while after I came to New Jersey at the age of 10, I was introduced to Final Fantasy Tactics by a friend of mine in Boy Scouts. The only other RPG I can recall owning at that time was Super Mario RPG, and so I didn't really have an idea of what I was getting into with Final Fantasy Tactics. But on his recommendation, I found a Greatest Hits version, and ended up changing my life. 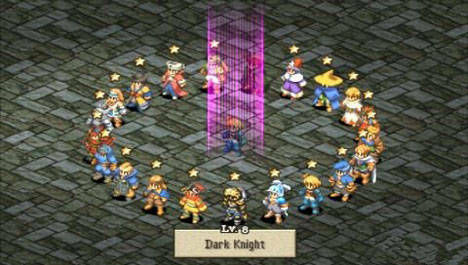 I still look back on Linde's review of Final Fantasy Tactics: War of the Lions and laugh. 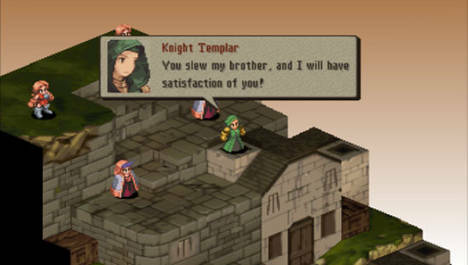 If you've played Final Fantasy Tactics, you know how true his feelings were. FFT quickly became an addiction for me once I popped the game into the disc. Up until this point, my gaming life was relatively casual. Books, friends, and Boy Scouts were more important to me, and gaming just sort of filled in the gaps and provided topics of idle conversation. On the PlayStation, Crash Bandicoot, Mortal Kombat Mythologies: Sub Zero and the like were what sat in my disc tray. I hadn't really delved into a game with a rich story or evolving characters, and Final Fantasy Tactics provided me with that first delve into what an RPG really was. When I first popped in the disc, I was absolutely floored. I reset the game four times, just to hear the title screen music over and over again. It's a haunting melody that could only prelude the events that would unfold in the game. As I played through the game, I came to understand strategy a lot better. I couldn't simply charge into the enemies to attack them -- I would quickly get surrounded. I started to use some basic maneuvering tactics to lure enemies into a spot where I could wail on them with multiple characters -- provided the NPCs didn't charge ahead and get themselves killed. Once I finished the game, I started it all over again. Once more after that. Before I lost all the save files on my PS1 memory card, I had gone through the game 15 times. I had unlocked every secret, gotten every class, and even gave a shot at a party with all white mages (it didn't work out very well). And I can still pick up the game to play it again at just about any time. I even picked up the War of the Lions remake as soon as it came out, just to get a chance to play it with some new cutscenes. 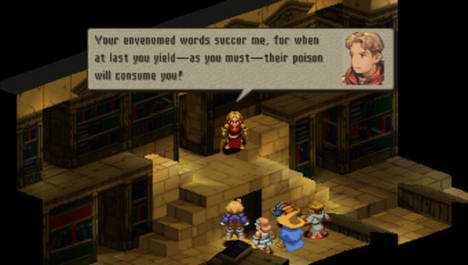 What Final Fantasy Tactics taught me was that there were deep, meaningful stories within games. Instead of reading a book and solely empathizing with the characters, as I played through FFT I felt as though Ramza's pains were mine, and the betrayals that happened were personal. It was so much more satisfying on an emotional level than reading -- a feeling that came back when I beat Metal Gear Solid 4. There was plenty in Final Fantasy Tactics to digest. Some blame the poor translation for making the story nigh incomprehensible, but it just took me a while to digest character motivations and such like that. I began to analyze why characters did what they did, and tried to see things from their perspective. It's a habit I picked up ever since, and was what pushed me into screenwriting when I went into college. I'm now an RPGer for life. There's no turning back now -- I will almost always turn to an RPG for an unparalleled experience in storytelling. Whether it be hanging out with my friends to play a game of GURPS, or holing myself up with the PS3 when Disgaea 3 comes out, I will always value potions, inns, and weapons dealers more than you could ever imagine.